There's no question that some housing markets around the country are showing signs of cooling. Price reductions are starting to show up again after an extended absence, the average home is staying on the market a bit longer, and inventory is finally coming up from the lowest levels in decades. To top it all off, this week's new construction numbers unexpectedly remained near 10-month lows. Combine that with rising rates, an expected seasonal slowdown in sales, as well as uncertainty about how long the current economic expansion will last, and it's more than fair to wonder if the housing market is in trouble. Yes, it's rising--especially for existing homes--but that's arguably a GOOD thing. 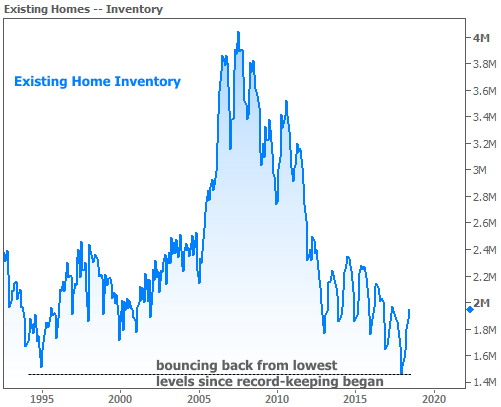 Existing home inventory had been on an unsustainable path lower. The bounce reflects much-needed cooling of what had/has been a lopsided sellers' market. Technically, there wasn't a big drop this week's (July's data). It was the last report (June's data) that had the big drop. This week's report simply kept housing starts at unexpectedly low levels (analysts were calling for a decent bounce). 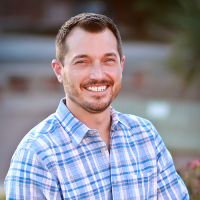 What is a "housing start" anyway? Think of it as the groundbreaking phase of home construction. 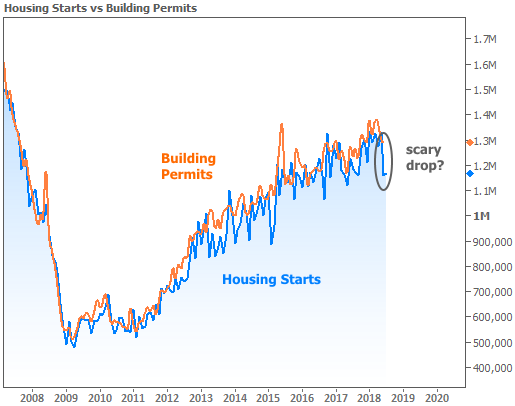 Building permits come first and tend to be a bit less volatile. After all, a permit is mostly paperwork whereas groundbreaking depends on weather, labor, materials, etc. That occasionally results in construction numbers like those seen in the past 2 reports. So how do we know if a big drop in housing starts can be chalked up to temporary variables? Many times, the easiest approach is to look at the numbers region by region. Last time, wild weather and flash floods in the Midwest dragged the numbers down. This time, the Midwest bounced back while the Western region took a turn feeling the effects from extreme weather (drought, high temps, wildfires). When we're pondering the fate the housing market, it's good to check in with builders. 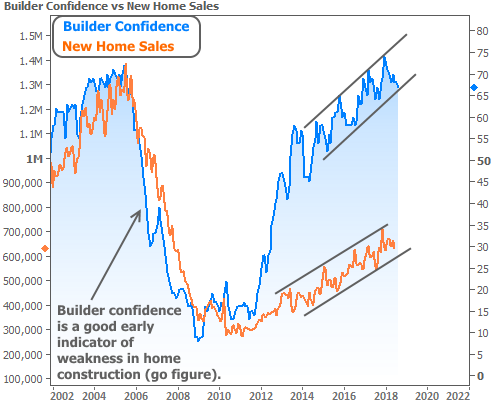 Confidence levels among builders are a good early indicator for new home sales. 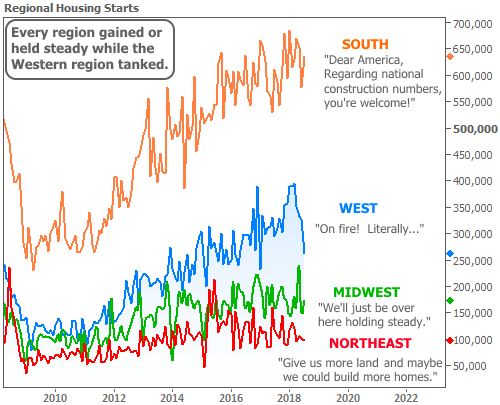 Incidentally, this week also brought the monthly builder confidence data, and while it's not skyrocketing back above recent long-term highs, it's definitely not painting the same picture as housing starts. The following chart shows the persistent uptrend in builder confidence (via the NAHB's Housing Market Index) overlaid with New Home Sales (Census Bureau). Bottom line: it's fair to discuss a 'leveling-off' in home sales. Certainly, the housing market isn't looking as invincible as it did a year or two ago. But that sort of invincibility isn't ideal. The pace of home price appreciation wasn't sustainable, and it still isn't. We're also seeing some of the effects of interest rates that have held near long-term highs fairly consistently. Rates have been doing fairly well over the past two weeks thanks to global economic jitters. But those jitters only add up to minor course corrections in the bigger picture. 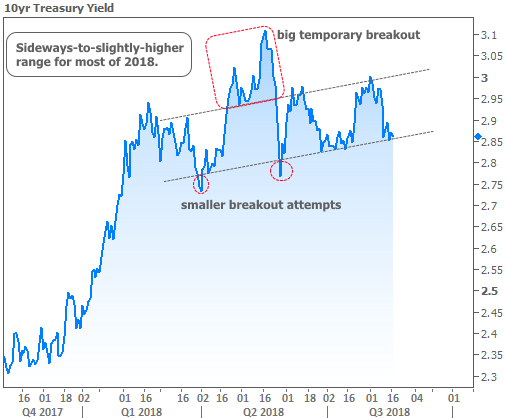 If we take a step back, we can see rates are moving sideways to slightly higher, despite a few attempts to break away from a fairly regular trend. 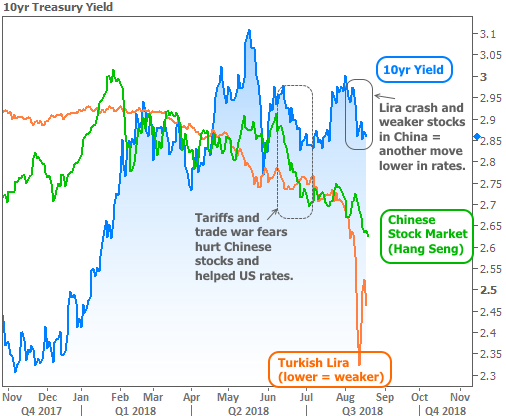 To put the global economic issues in perspective, consider that Turkish Lira and Chinese equities were two of this week's key stories. What happens if we overlay those indicators on the same chart of interest rates? If you look hard, there are a few examples of correlation, but Treasuries are definitely doing their own thing. Contrary to popular belief, mortgage rates aren't based on US Treasuries, though there is plenty of correlation. That means mortgage rates can also do their own thing at times. 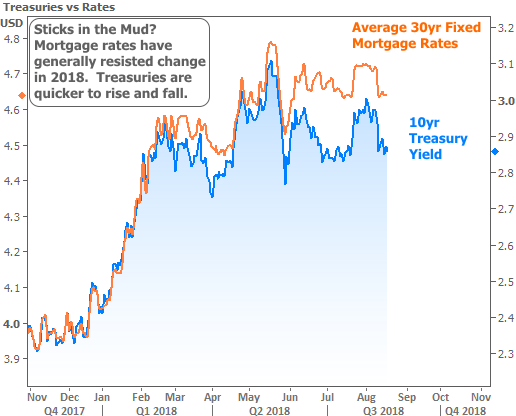 This is usually hard to spot, because they tend to move in lock-step with Treasuries, but if we look at them side by side, we can see mortgage rates have been more reluctant to return to February's levels compared to 10yr Treasury yields. This can eventually change, but until it does, sideways-to-higher rates aren't doing any favors for the housing market. Then again, that could depend on your definition of "favors." To whatever extent the housing market was too hot and needed to cool off a bit, mortgage rates near 7-year highs are happy to help.